Treemaps aren’t new – they’ve been around for a few decades, and yet they remain a powerful and compact way to visualize hierarchical and part-to-whole relationships. Tableau Public 8.0 has them, too. What isn’t so common, however, is a way to create multiple interactive treemaps and easily arrange them into a bar chart for comparative purposes. Say hello to treemaps in Tableau Public 8.0! Now, as most of us have come to realize, cash and debt are two very different things. Furthermore, they don’t sum up to anything particularly meaningful in this context because companies have other line items on the balance sheet such as inventory and assets. 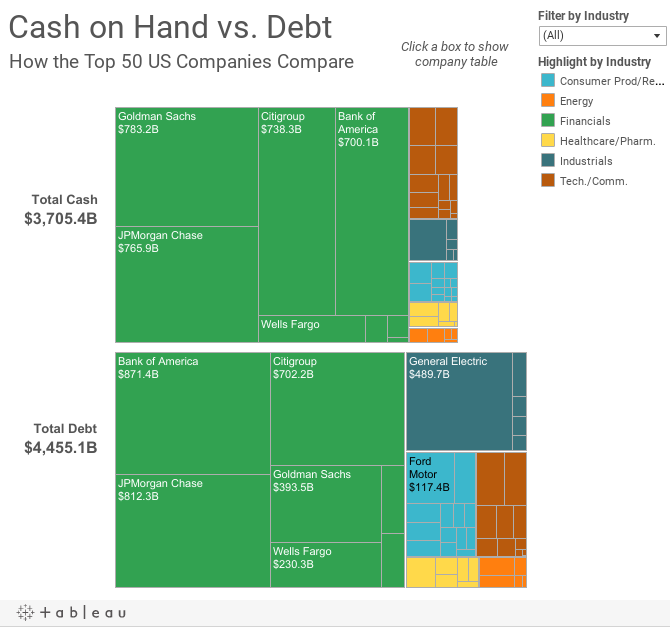 Comparing the overall amount of cash and the overall amount of debt is interesting, though. And what more accurate way to compare two values than to use a bar chart? Next week Max Marboeuf will be looking at Bubble Charts. Did Tableau Public add comments without mentioning it? Or did I just miss the announcement? Hi Shawn! Thanks for the comment. We've been allowing comments on the Tableau Public blog pages for a while now, but really haven't made any announcements about it. Good to know that this was news to you - we'll get the word out.